• Israeli minister of defense Moshe Ya’alon openly admits to AIPAC crowd: “We decided to allow” 2013 military coup. One of the hallmarks of Zionists is the duplicity with which they treat non-Jews. But among their own, they speak openly and even publicly about their societally corrosive activities. A prime example of this is the speech given by Israeli Defense Minister Moshe Ya’alon to the March 2016 Policy Conference of the American Israel Public Affairs Committee (AIPAC). According to Middle East Monitor (MEMO), in a translation of an article from Al-Araby Al-Jadeed, Ya’alon boasted that Israel had given its permission for a military junta-led coup under General Abdel Fatah al-Sisi in 2013. 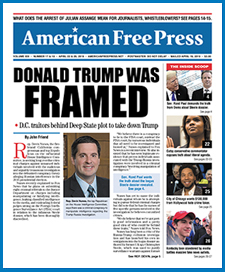 AMERICAN FREE PRESS reported already in August 2013 that the United States and Israel were behind the overthrow of the Mohamed Morsi government. Ya’alon’s statements, however, are a brazen confirmation of what AFP was nearly alone in reporting at the time. This is a stunning remark. First, “We decided to allow” demonstrates clearly that Israel was the kingmaker in 2013. U.S. and Central Intelligence Agency involvement appears to have been at the behest of and for the benefit of Israel. The second sentence is no less revealing. By distinguishing the Zionist Occupation Government in Palestine from “the West,” Ya’alon shows that Israel considers itself a state sui juris—a law unto itself. The implications can hardly be overstated and make the Zionist regime a dangerous rogue power in geostrategic politics. Why military regimes? First, if the military government is friendly to Israel, as in Egypt, it is better able to suppress activities of its own citizens considered hostile to Israel. Representative governments must be more responsive to the populace and may take positions or safeguard rights permitting greater freedom for protest actions or aid to beleaguered Palestinians. Second, if the military government is hostile to Israel, it provides a propaganda bonanza for the Zionist state, allowing the Israelis to further delude Westerners with ridiculous claims that theirs is the “only democracy in the Middle East” and “America’s greatest ally” in the region. This, from a repressive Zionist government that established its occupation of Palestinian lands through terrorism and deceit, mercilessly dispossessing the rightful inhabitants, just as it continues to this day to practice genocide against native Palestinians and maintain a massive stockpile of nuclear weapons not subject to the Treaty on the Non-Proliferation of Nuclear Weapons (NPT). And despite having one of the wealthiest economies in the world, the Israelis bilk billions of dollars annually from Western sheeple. Al-Araby further points out that Ya’alon called on AIPAC adherents to support the al-Sisi regime in Egypt. This is part of a campaign of “normalization”—an Israeli code word for co-opting other nations. “Normalization” refers to the effort to get opponents to support the racist Zionist state. On the one hand, Israel buys support through foreign aid and economic ties to Egypt. On the other, it enlists Egyptian “useful idiots” to begin speaking and acting as though Israel were a friendly nation. A primary purpose is to mitigate the burgeoning Boycott-Divestment-Sanctions (BDS) movement calling attention to Israel’s atrocities against Palestinians. The ultimate goal is to achieve full acceptance of Israel, without ever changing its evil ways. But the Palestinians pay the price in blood and loss of their homes. The process of “normalization” is well advanced in Egypt, making that country a useful tool in Israel’s efforts to isolate and exterminate the Palestinian people. Previously, aid could be smuggled into the Gaza Strip through the Sinai peninsula. Al-Sisi put a halt to that. The U.S. should stop protecting and funding the apartheid, rogue nuclear state of Israel immediately. In fact, all U.S. aid given to Israel has occurred illegally since 1976 and should be repaid by the Zionists to American taxpayers. Sections 101 and 102 of the Arms Export Control Act of 1976 prohibit foreign aid to any country with nuclear weapons, like Israel, which is also a non-signatory of the NPT. Write or call the president and Congress today. Tell them to follow the law and end all aid and assistance to Israel. The mother of General al-Sisi is a Moroccan Jew. He is long suspected of being a Zionist himself!